The United States Agency for International Development (USAID), a major organization for non-military foreign assistance, is closing shop in Russia. A Russian Foreign Ministry statement has accused USAID of attempting to influence political processes in Russia – an accusation which the U.S. State Department denies. Twenty years ago, an American company won a USAID grant to provide information and promotional support for the privatization process in Russia. The firm’s staff, which was made up mainly of advertising and public relations specialists, tried earnestly to contribute to Russia’s speedy transformation from a “Communist dictatorship” into a “free society”. Just about all of these specialists were competent in their own spheres unfortunately, they were all in Russia for the first time and knew virtually nothing about the country. One supervisor, for example, did similar work in Bolivia before coming to Russia. He was convinced that it made no difference what was being privatized and where. 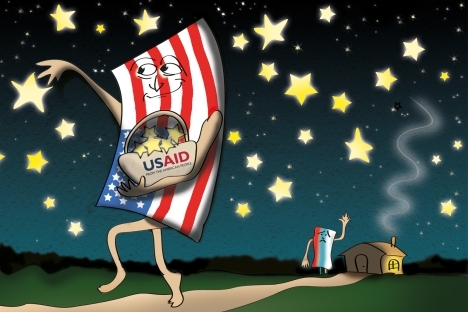 Whatever the mechanism for curtailing USAID work in Russia, it is in line with the current official course of limiting the presence of foreign organizations whose financial assistance can be interpreted as involvement in the political life of Russia. For instance, Russian governmental bodies were particularly incensed by USAID support for the Golos association, which monitored the elections in Russia and was thus directly involved in assessing the legitimacy of the government. In his pre-election article in February, Vladimir Putin described such forms of influence as inadmissible. Consequently, a recently passed law requires foreign grant recipients to register as foreign agents. Aside from the excessive suspiciousness of Russian authorities and their tendency to see threats everywhere and use prohibitive measures, the issue of outside financing for processes involved in the functioning of the state is very complicated and delicate. Globalization makes the state border permeable, so that internal processes resonate abroad. Any state, whether democratic, authoritarian or transitional, faces diverse forms of external influence – cultural, informational, economic, political and humanitarian – and tries to control it, if not fence itself off from it. The Western approach to foreign aid – especially the American approach – assumes that only one correct model exists for social and political systems. Where, for whatever reason, this model is absent or unstable, it is assumed that an unquestionable, universal mission is necessary to form that model. All foundational documents that define the scope and character of such aid state that this aid is an instrument of U.S. policy, because it contributes to creating an international environment that helps the U.S. achieve its goals. There is no contradiction here, since the political philosophy of America has long been based on the assumption that America is the correct social-political model. America’s rise to a position of world dominance in the 20th century and its impressive record in several areas bears this out, in the opinion of many Americans. Hence, the assertion of American ideals in other countries contributes to the prosperity of foreign states and the success of the United States at the same time. On the other hand, the reluctance of foreign governments and societies to follow this path is interpreted as misunderstanding or ill will. Self-righteousness that has always been America’s strength: unlike Europe, America is not given to self-doubt and soul-searching. Yet this may be a weakness that entails setbacks and failures, as well. The American conviction that universal principles supersede national differences and bring success when supported, first, provokes growing resentment in many parts of the world with its sheer aggressiveness and, second, is often counter-productive. Fyodor Lukyanov is Editor-in-Chief of the journal “Russia in Global Affairs.” First published in Russian in RIA Novosti.